Ever since I watched the New Mexico episode of Burger Land with George Motz (burger god!) 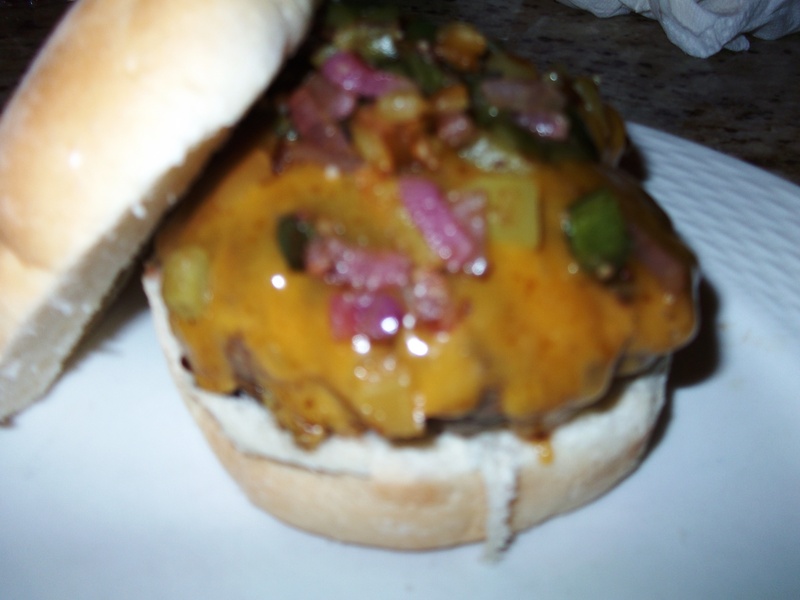 I wanted to try making my own Green Chili Cheeseburger. Dad made a batch of green chili relish and I made sure we had the right blend of ground beef (Alton Brown’s recommended 50% chuck and 50% sirloin), the right cheese (a nice yellow cheddar), and the right hamburger buns (kaiser rolls, because these are going to be big burgers). I decided to make big burgers. Not just quarter-pounders, but third-pounders! So 1 lb of ground beef made 3 hefty burger patties. I remembered to put a “dent” in the middle of each patty like Bobby Flay recommends. You should try doing that. It’s a simple trick and it really stops your burgers from turning into puffed-up baseballs. Dad did the actual cooking because it’s “his” cast iron skillet and gods-forbid that anybody else touches it! He cooked each burger separately. First mine, then Mom’s, then his. Each burger got 3-minutes on one side, then 1-minute on the other side, then he put on 2 slices of cheddar and covered the burger with a bowl to let it “steam cook” for another 2-minutes. The burger patty was cooked to a perfect medium and the cheddar cheese was melted all over the patty. Assembling the burger was easy. Kaiser roll, burger patty with melted cheese, spoonful of green chili relish. Thanks to George Motz for the idea, thanks to Alton Brown and Bobby Flay for the “how to” instructions, and thanks to Dad (I suppose!) for doing the cooking. And it’s chili, not chile. Chile is a country, not a pepper. 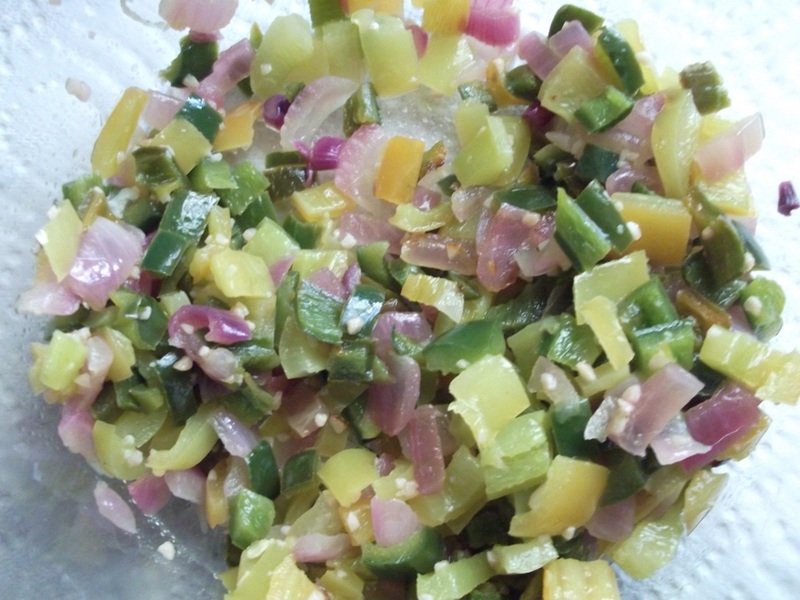 Dad made a batch of green chili relish which will be eaten later today as toppings on homemade chili cheeseburgers. 1. 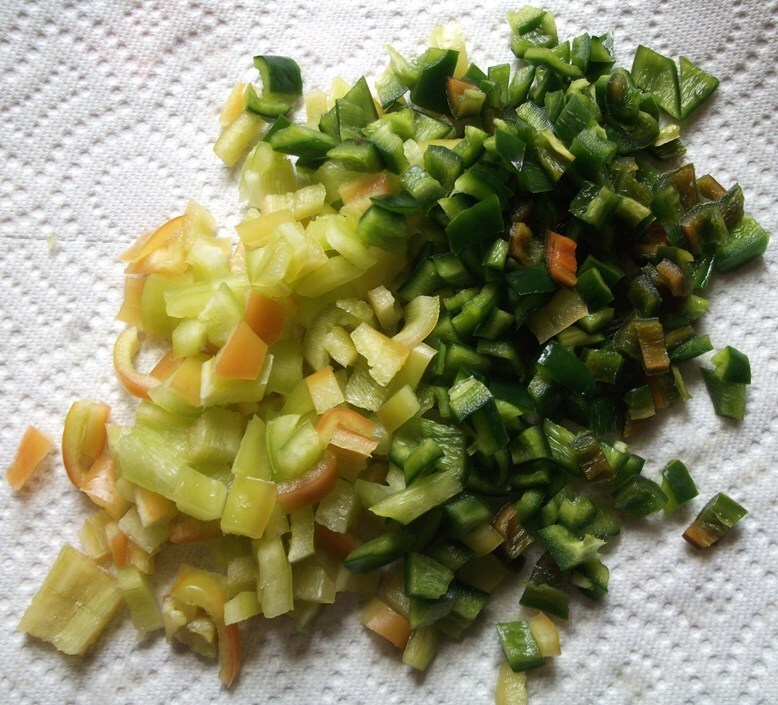 Select some fresh peppers. These are from a farm stand in New Jersey. This recipe requires 1 of each pepper and is sufficient for 4 burgers. You can scale up the recipe easily (e.g. 4 of each pepper, a whole onion, 8 cloves of garlic), but don’t crowd the pan. Cook in batches. 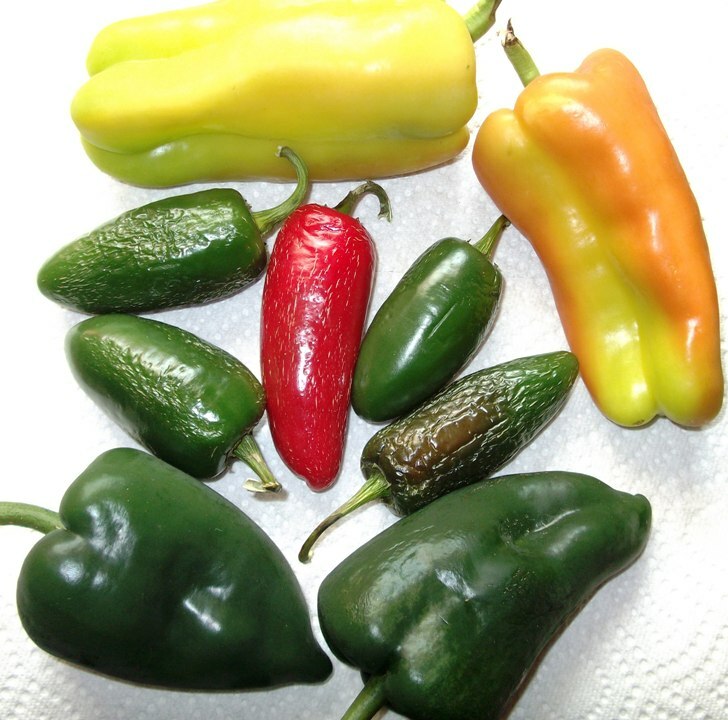 Jalapeño, Poblano and Cubanelle peppers. 2. Dice the peppers. Not too big, not too small. Chop the onion and garlic to a similar size. All of the ingredients should be the same size to cook evenly. 3. 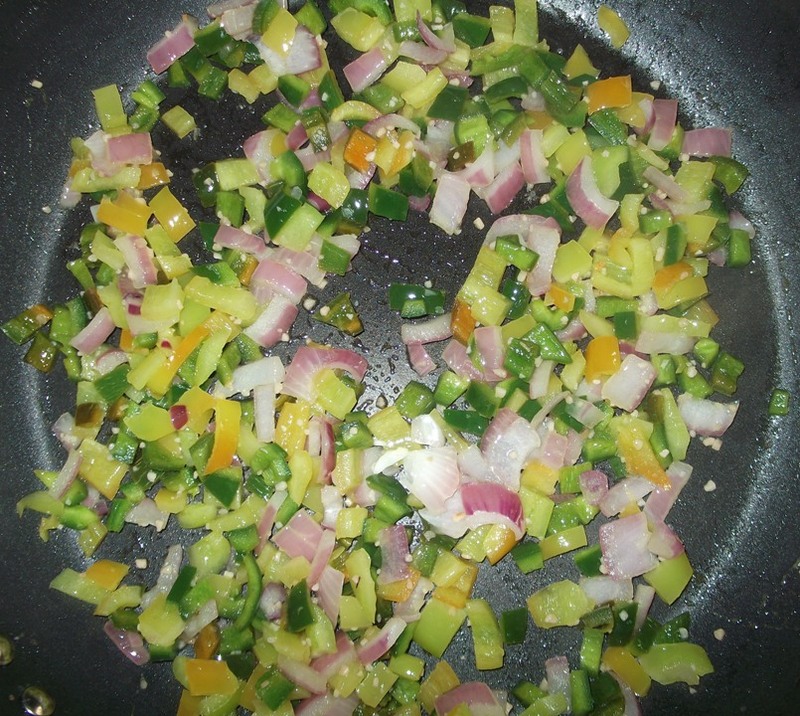 Sweat the peppers, onions and garlic in a splash of olive oil. Add a good pinch of kosher salt. Sweat the ingredients to release the flavors. Don’t sautée them. Don’t fry them. Sweat them gently. This will retain moisture while releasing flavor. 4. The relish is ready to go. Use it on your chili cheeseburgers! Dad drove into Baltimore today and he battled the downtown traffic until we found Kooper’s Chowhound parked on the corner of Greene and Baltimore. 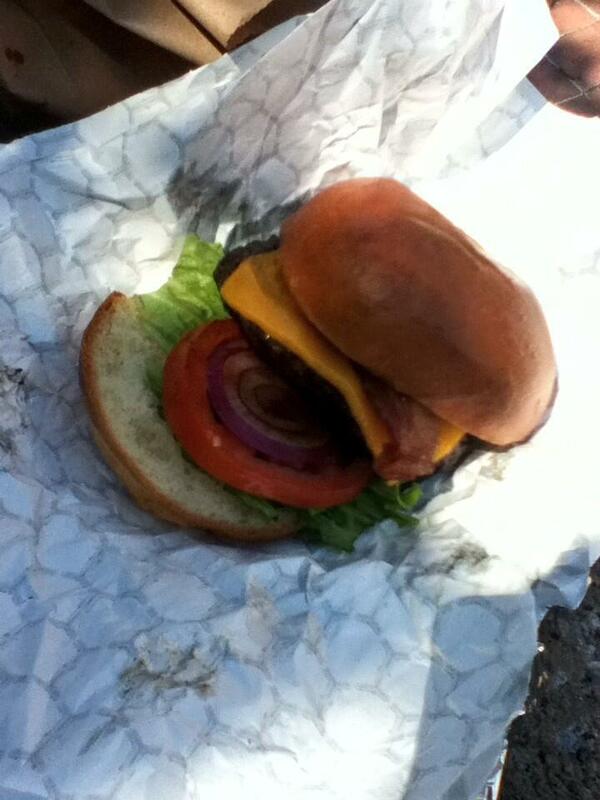 I love the burgers from Kooper’s Tavern in Fells Point and from the Chowhound food truck. I think they might be the best burgers in Baltimore. Last time I reviewed the Chowhound I ordered the MacGuinness burger. Guess what I ordered this time? The same! The MacGuinness burger is a 100% Black Angus patty, char grilled on the food truck, served with applewood smoked bacon, cheddar cheese, lettuce, tomato, red onion, on a brioche bun. My burger was cooked perfectly! The char grilled taste was amazing. The burgers come off the grill and onto the bun and into your hands in seconds. Now that’s fresh! I award this burger 8.5 out of 10. That’s 8 points for the burger and an extra half point for eating it from a food truck. It was an awesome sunny day and I got to chow down on “street eats” in the city. If you can track down the Chowhound then you should. Food trucks are awesome. I was feeling “blah” and totally bored (Dog Days of Summer?) so Dad drove me down to White Marsh and we went to Z-Burger. Z-Burger is like a Five Guys or a Gino’s or a In-N-Out. I think Z-Burger is a local chain (DC-Batimore area) with just a few restaurants. But it’s kinda the same as the others. I ordered a single cheeseburger with lettuce and tomato. Side order of half fries, half onion rings. And a strawberry milk shake. The burger was OK. Not great. Not awful. Just average. I would award it a score of 5.5 out of 10. The fries were good. They were nice and crispy. The onion rings… yuck… not so good! They had too much batter. I threw most of them away because they were really not good to eat. The milkshake was made with ice cream and this is something that Z-Burger does really well. We sometime stop here just to get milkshakes. You might have to wait a long time on a hot day, but they are GOOD! I would recommend Z-Burger if you are shopping in the White Marsh area. The burgers are OK. But don’t get the onion rings. Move aside afternoon tea obsession – there’s a new mania in town – and it likes BURGERS. Yes, in the past week I have side-stepped my sweet tooth and fallen for the meaty, meaty taste of the trendy burger joint. More socially acceptable than McDonald’s, and cooler than a hipster with a beard, riding a tandem bike (yes, this picture exists), a new breed of burger bar has taken over London in a flurry of rosemary salted chips and cajun flavourings. And, like all pointless crazes, it has caught me in its barbeque-glazed yummy trap. From Patty and Bun to Dirty Burger, new burger joints have been popping up everywhere, and like I said, are the latest trend to have hit the capital. I do not want to eat fake meat from a laboratory. The world’s first lab-grown burger is seen after it was cooked at a launch event in West London. (Reuters) – The world’s first laboratory-grown beef burger was flipped out of a petri dish and into a frying pan on Monday, with food tasters declaring it tasted “close to meat”. Grown in-vitro from cattle stem cells at a cost of 250,000 euros ($332,000), the burger was cooked and eaten in front of television cameras to gain the greatest media coverage for the culmination of a five-year science experiment. Resembling a standard circular-shaped red meat patty, it was created by knitting together 20,000 strands of laboratory-grown protein, combined with other ingredients normally used in burgers, such as salt, breadcrumbs and egg powder. Red beet juice and saffron were added to give it colour. Professor Mark Post holds the world’s first lab-grown beef burger. The two food tasters were reserved in their judgement, perhaps keen not to offend their host at the London event, noting the burger’s “absence of fat”. Pressed for a more detailed description of the flavour, food writer Josh Schonwald said the cultured beef had an “animal protein cake” like quality to it, adding that he would like to try it with some of the extras often served with traditional burgers – salt, pepper, ketchup and jalepenos. Even the scientist behind the burger’s creation, vascular biologist Mark Post of Maastricht University in the Netherlands, was relatively muted in his praise of its flavour. “It’s a very good start,” he told the hundreds of reporters who had gathered to watch the meat being cooked and served. The Dutch scientist’s aim was to show the world that in the future meat will not necessarily have to come from the environmentally and economically costly rearing and slaughtering of millions of animals. “Current meat production is at its maximum – we need to come up with an alternative,” he said. The World Health Organization (WHO) says meat production is projected to rise to 376 million tonnes by 2030 from 218 million tonnes annually in 1997-1999, and demand from a growing world population is expected to rise beyond that. According to a 2006 report by the U.N. Food and Agriculture Organization (FAO), industrialised agriculture contributes on a “massive scale” to climate change, air pollution, land degradation, energy use, deforestation and biodiversity decline. The meat industry contributes about 18 percent of global greenhouse gas emissions, a proportion expected to grow as consumers in fast-developing countries such as China and India eat more meat, the report said. Chris Mason, a professor of regenerative medicine at University College London, who was not involved in the research, said it was “great pioneering science” with the potential to ease environmental, health and animal welfare problems. But, he added: “whilst the science looks achievable, the scalable manufacturing will require new game-changing innovation”. Post said he was confident his concept can be scaled up to offer a viable alternative to animal meat production, but said it may be another 20 years before lab-grown meat appears on supermarket shelves. He also conceded that the flavour of his meat must be improved if it is to become a popular choice. Josh Schonwold, a US based food writer, tastes the world’s first lab-grown beef burger. Post resisted requests from journalists from all over the world eager to try a morsel of the world’s first cultured beef burger, saying there was not enough to go around. Instead, he said, his children would be offered the leftovers. Dad drove up to Gettysburg for one of our regular field trips to the battlefield and we decided to look for somewhere that served burgers. 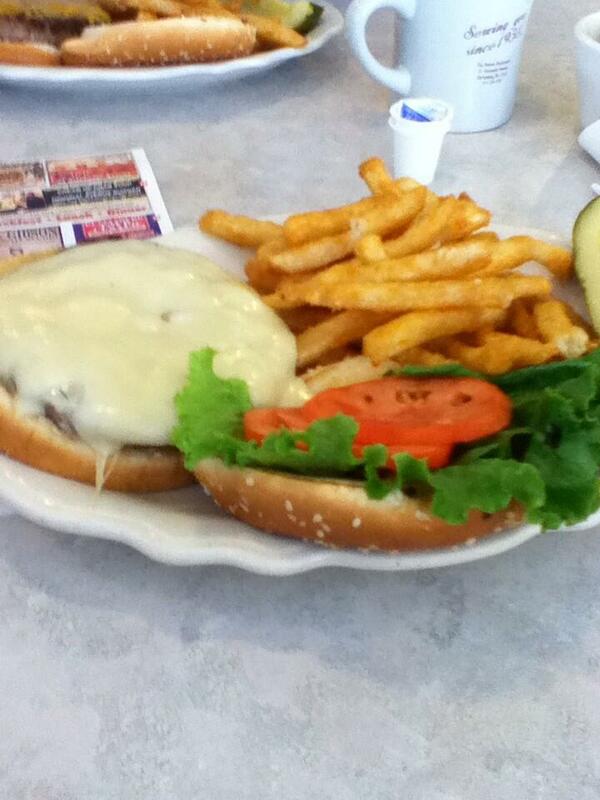 We stopped at The Avenue Restaurant which is a diner on Steinwehr Avenue. 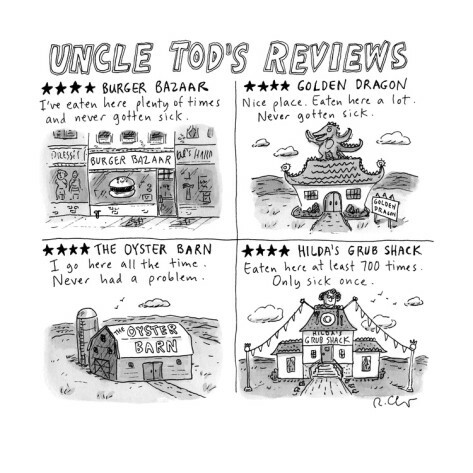 Dad is always talking about restaurants like this one. “Old tables…” blah, blah, blah. “Booths….” blah, blah, blah. “1950s…” blah, blah, blah. “Homestyle cooking…” blah, blah, blah. “How restaurants used to be…” blah, blah, blah. The waitress kept bringing him fresh coffee and he can drink buckets of that stuff. There were old photos and newspaper articles hanging on the walls. Dad loves all that junk. So this restaurant made him really happy. We both ordered burgers. I ordered the Avenue Burger (6 oz ground steak patty) with lettuce, tomato and Swiss cheese (my choice, other cheese also available). Dad ordered a Michael’s Special bacon cheeseburger. He can only get away with diet-busting food when Mom isn’t there! My burger was decent for a diner burger. The 6oz patty is a good size – not so small that it shrinks when cooking & not so big that you can’t eat it. The Swiss cheese was nicely melted onto the burger. I agree with Bobby Flay that cheese should be melted onto the burger and not sit there as a cold slice. But there was a lot of cheese… perhaps too much? I had my burger patty cooked “medium well” and it was nice and juicy. My side order of French fries was crispy. I did not eat my pickle spear, but Dad said they were good & crunchy. I award the Avenue Burger a score of 6 out of 10. I would have said 6.5 out of 10, but I think there was a just a bit too much cheese. I will definitely be back at The Avenue Restaurant on future trips to Gettysburg. We roll in once or twice a year, so it won’t be long! I ate the 227th “Triple Triple” at Jake’s Wayback!